Last week the nice people at Riverford Organics very kindly sent me a box full of their lovely muddy veg (carrots that actually smelt of … carrots when I peeled them. Incredible), and, thanks to the lovely weather, and being out a lot saying no to ham and meatballs and yes to sherry, I’ve been dealing mostly in salads this week. 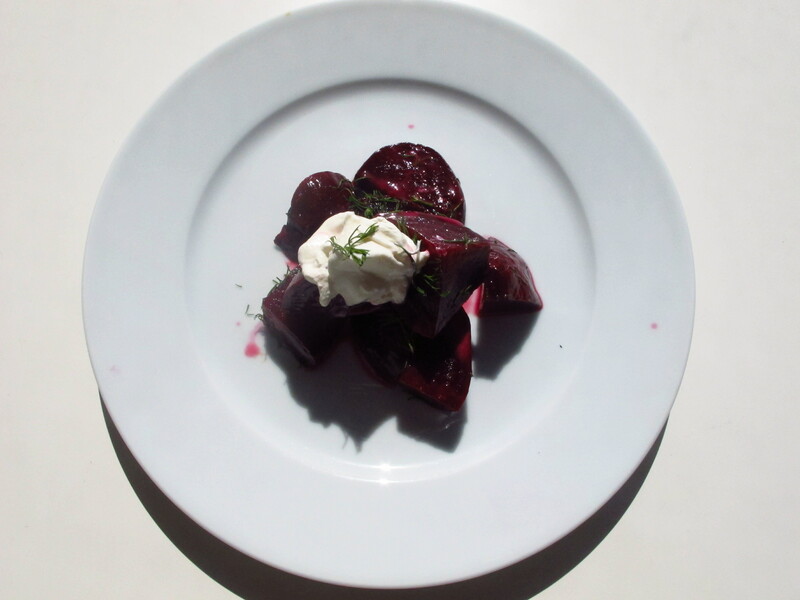 Baked beetroot with a mustardy vinaigrette, dill and sour cream (the fruits of the barszcz marathon) was Tuesday’s. It was inspired by a Diana Henry recipe, but I added the dressing myself, because I can’t bear beetroot without something acidic to balance all that woody sweetness. I blame it on the fact that, until I was about 14, I believed it grew pickled. Polish sour cream really is good by the way. 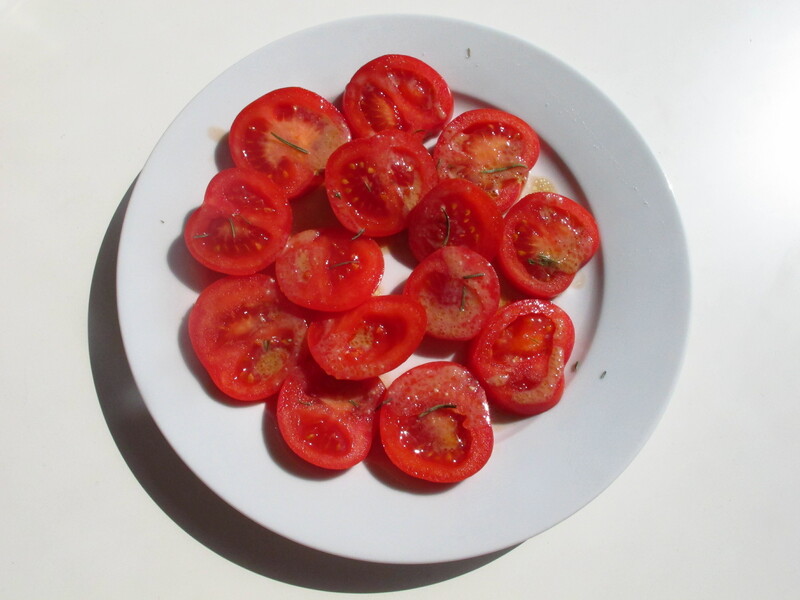 Don’t usually find myself eating fresh tomatoes as this time of year, but these, dressed in yet another mustardy vinaigrette, this time with rosemary, were surprisingly good – cool and savoury, rather than intense or sweet, but a welcome flavour of the summer to come. Then tonight, in for the first time this week, I embarked upon something from Guy Watson and Jane Baxter’s Riverford Farm Cook Book. 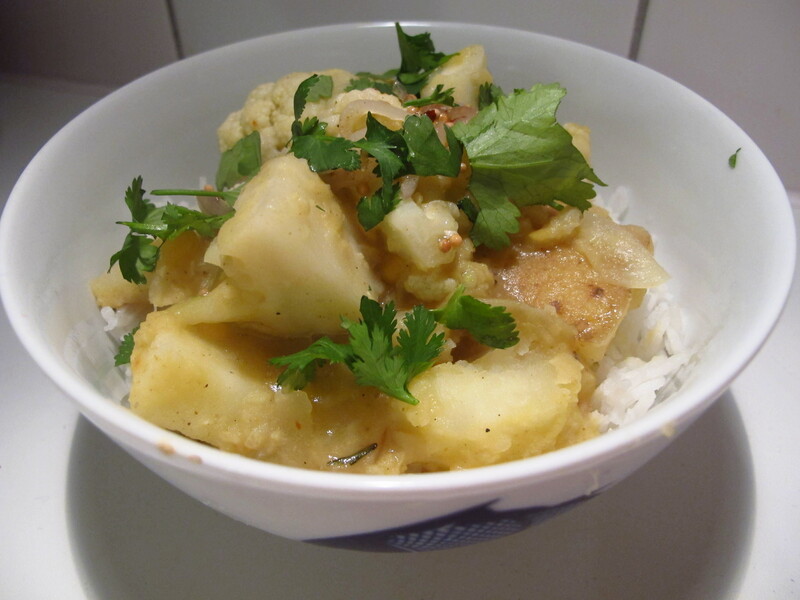 I was going to make a lemony salad (no mustard, promise) from the fine cauliflower that was the crowning glory of the box, but a girl can only eat so much raw stuff, so instead I went for Jane’s cauliflower and potato dal, inspired by her time in the all-female kitchen at the famous Hansa’s Gujerati in Leeds. Dal never ever disappoints, and this, made by softening onions and celery (a surprising ingredient here, to my mind) with garlic, ginger, curry powder, nutmeg and black pepper, then adding yellow split peas and vegetable stock, then cubes of potato, and then, finally the cauliflower, and letting it all simmer until cooked through. The genius of the dish, I think, really lies in the ‘final frying’ as it’s referred to in the book: thin slices of shallots and garlic fried with mustard seeds and chilli flakes, laced with lemon juice and sugar and stirred through just before serving. I made a disappointing dal once Felicity – I somehow managed to make it bitter. One theory was I failed to spoon off the scum. Mmmm, delicious. I’m going to give this one a go – I like the idea of the cauliflower in there. I agree with the ‘final frying’ and stirring through. I think it adds another level to the dal (maybe the punchy level). I usually add curry leaves into the mix as well. This sounds dcioelius! My mother-in-law dresses hot cauliflower with lemon juice, olive oil and lots of parsley and it’s great. I’d like to try your recipe with the garlic and mustard addition. Spice is the way forward with cauliflower I reckon – beats the hell out of a cheese sauce.